Notice Elizabeth Taylor (the furry assistant) in the foreground? She approved. We were originally thinking this art would go wonderfully in the lobby, but it turned out to be too large in terms of scale. We decided to feature it in the hallway across from my office. I'm sure I'll love seeing it every time I walk out of my office! The artwork is perfect and I love the geometrical accessories! Modern and masculine. I absolutely love them! Elegant, classic, luxurious ... the perfect representation of who we are as as company. In line with the accessories, the cabinets are modern and classic ... I love the way it looks. 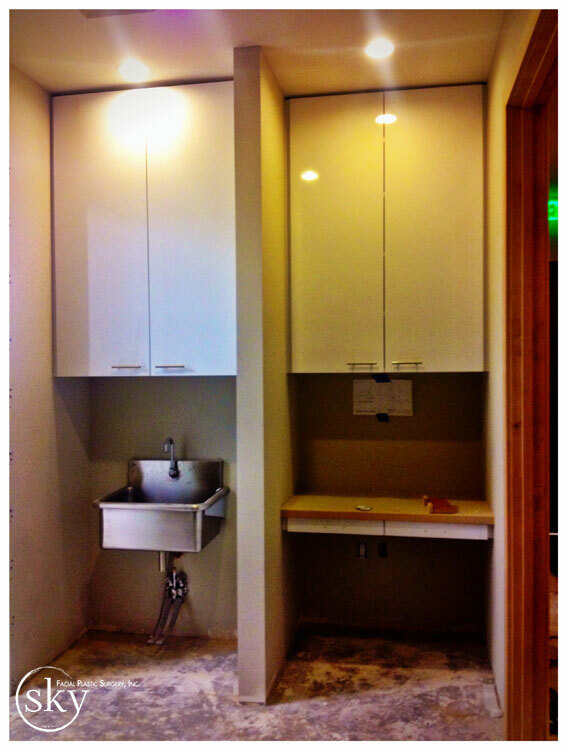 Here's another shot of the sterilization room below. You can see Dr. Yoo checking out the oxygen tank storage closet. 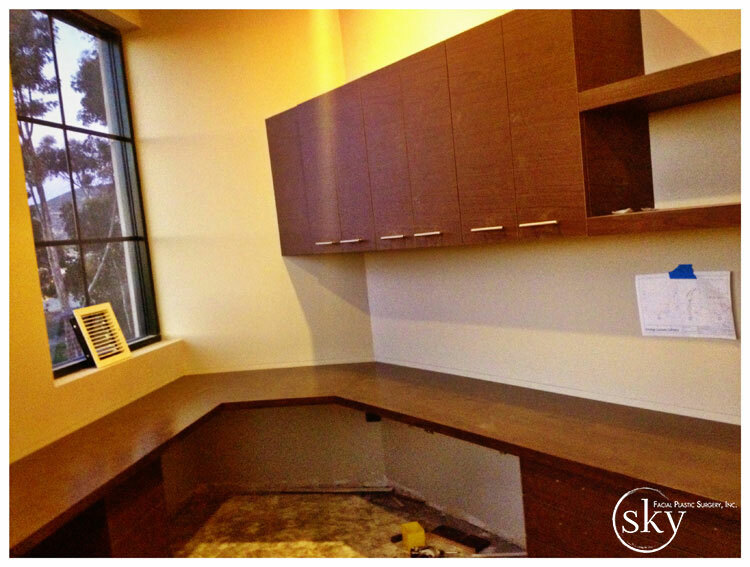 And finally, my office desk and millwork is done! The desk is totally custom to match the unique angles of the walls. I'm left-handed, so my computer monitors will be mounted on the wall to the right of the window, giving me a left desk return. Notice the crown molding? A nice touch, I think. I was also extremely happy to see the walls of the assistant station up! 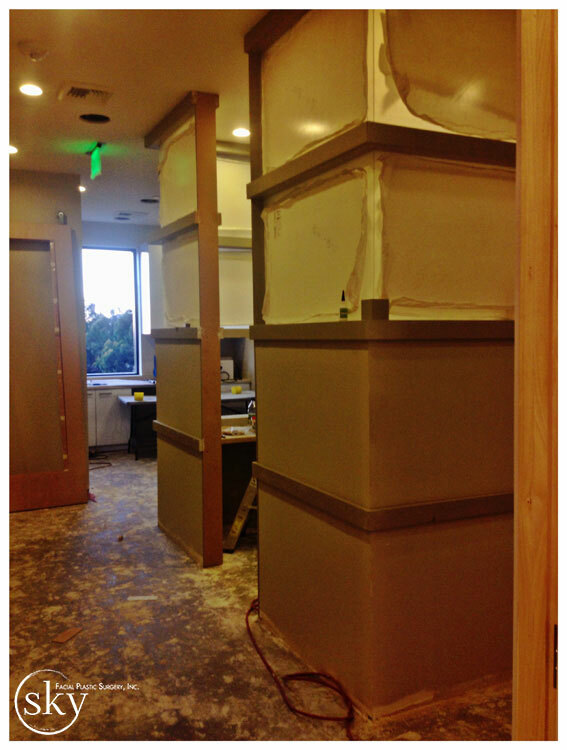 You would not believe how complicated these walls were to design and build! The bottom two panels are drywall and the top two panels are frosted glass, to allow natural light to filter through. Figuring out a way to support the weight of the glass panels while still maintaining the sleek, paneled look was challenging for everyone involved. I also noticed that our first door was installed! This is the door that connects the lobby to the interior hallway. A frosted glass panel will be inserted at a later point. 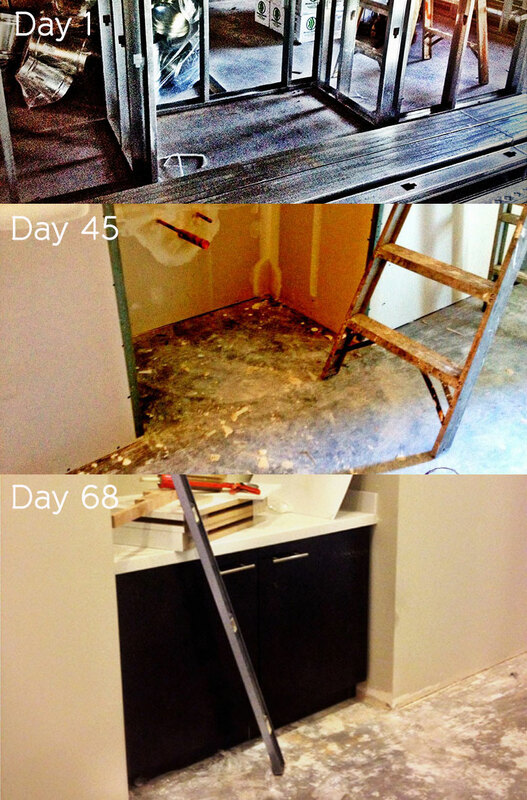 Read the next post in this series - "Day 72 - Tile, Doors & Sign"